This post relates to the workshop, “Marketing BRT: How to Attract and Captivate Users,” co-hosted by the Secretary of Transportation of Rio de Janeiro and EMBARQ Brasil (the producer of the newly launched TheCityFix Brasil), and sponsored by Fetranspor. Participants included about 100 representatives from 10 Brazilian cities (Belo Horizonte, Rio de Janeiro, Sao Paulo, Goiania, Salvador, Florianopolis, Natal, Curitiba, Vitoria and Porto Alegre), as well as guests from the United States, Peru and India. 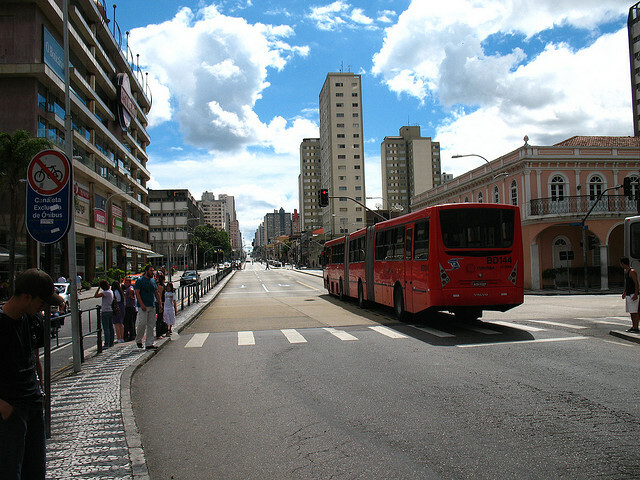 Bus rapid transit, which originated in Curitiba in the 1970s, remains prominent in Brazil, but its environmental and social benefits are still not fully known or understood by the public. In the lead-up to the 2014 World Cup and 2016 Summer Olympics, Brazil has been working diligently to upgrade its urban infrastructure, with a special focus on BRT. The country’s rapid economic growth, too, has required massive investments in improving mobility for people living in fast-growing cities. The country already has 20 cities with more than 1 million people. Marketing the concept of BRT has become even more important now that the city is developing four new BRT corridors, in time for the 2014 World Cup. Undersecretary of Transportation for the Municipality of Rio de Janeiro Carlos Maiolino stressed the importance of continuing to invest in high quality public transport, such as the city’s TransOeste, an east-west BRT corridor currently under construction. Another planned corridor, TransCarioca, will link Barra da Tijuca to the Tom Jobim International Airport. Many people are still unfamiliar with the concept of BRT, which poses a communications challenge for the local transit authorities. Rio has initiated a transport project called Bus Rapid Service (BRS), which borrows some of the elements of BRT, such as segregated bus lanes, in an effort to relieve congestion and cut travel times. Only taxis, emergency vehicles and police cars are allowed to use the corridor. To implement the new system, the city launched a marketing initiative to brand the new corridors and make it easier for passengers to hop on board. Little details make a big difference in establishing customer loyalty. For example, BRS employees distributed roses to women with children on Mother’s Day this year, generating extremely positive feedback from the users. “It was a small experience that shows how you aggregate value,” Fornasari said. BRS staff often go out into the streets to distribute flyers and pamphlets with important information and answer questions from passengers. For example, when some existing bus stops were removed from the corridor during the development of the re-organized routes, BRS deployed its employees to explain how the new changes would affect people’s commutes, especially targeting youth and the elderly. Fetranspor displays a customer service toll-free number behind all its buses to give users feedback on quality of service—and it’s completely voluntary. Fornasari said 80 percent of calls are about trip itineraries and schedules, with some occasional driver complaints. “You have to promise one thing at a time and you must not make big promises because the public is not prepared for great transformations,” Fornasari said. “If I delivered what I promised, my product is considered good; otherwise I cause frustration.” BRS’s marketing promise was that it would provide more-than-average speed. The promise was fulfilled: average travel times have been reduced by 11 percent to 13 percent. BRS works conscientiously to incite people’s desire to use public transportation, especially the youth’s, who may one day desire a car, Fornasari said. At first, Fornasari said, there was some resistance to the name “BRS,” considering they are more accustomed to “BRT.” “People were wondering, ‘What is this? This doesn’t make sense!’ he said. But after some time, and a conscious marketing push, the public’s perception fo the system is improving. Sharing customer service information and data in a simple and visually appealing way is one of the key elements of creating good user information systems. Before BRS re-vamped the corridors, only 0.29 percent of bus stops had information, Fornasari said. Now, bus shelters include a route map with strong BRS branding, and all buses are clearly identified, with bus lanes clearly painted on the ground. All these efforts have paid off. Veja, a prominent magazine, wrote a headline: “It’s better to go by bus.” Survey results showed that 14 percent to 41 percent of people like the new buses, and half of those interviewed said traffic has improved very much.